Learn French in Nice at our partner French institute, Alpha B. Alpha B is a language school which has a very personal character thanks to it's enthusiastic team of teachers. All French language students will fit in very easily here. 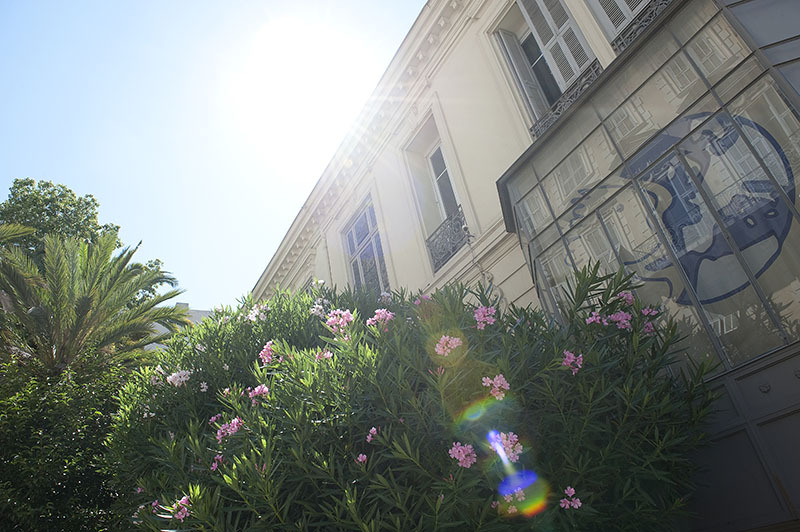 The school is situated in a lovely, large building with its own garden, close to Nice's shops, beaches and old town. Learn French in Nice by taking an intensive French course. The intensive course consists of either 20 or 30 French lessons per week. The course is focused upon helping you to improve your French grammar, vocabulary, speaking, listening and writing. If you choose to take the 30 lesson per week intensive French course, 10 lessons will be devoted to the practical application of your French knowledge, including lessons about French culture, society, politics and life during 3 afternoons per week. The course with 20 lessons is available for all levels, the course with 30 lessons requires an elementary level of French. The intensive course of 30 lessons is not available for complete beginners. Please note that during peak season and every time when necessary, lessons taking usually place from 9.00 to 12.20 might take place in the afternoon from 16.00 to 19.15. You share an apartment with French people. Usually there will be no other student living there. A single room in a studio is a studio for one person. It is also possible to book a studio for two people who travel together. (prices on request). From 31/03/2019 till 28/09/2019 a supplement of € 150 per week per person applies up to 4 weeks. From 5 weeks on a supplement of € 100 per week per person applies. It is possible to book breakfast, the price is € 8 per person per day, to be paid directly at the residence. Parking is available by paying € 90 per car per week, to be paid directly. Airport transfer on arrival when staying in a host family and with arrival during weekends between 08.00 and 22.00. You should inform your host family of your arrival time at least 3 days in advance. For other accommodation, the school does not book this service, since the airport is not far away from the Nice city centre. Taking a taxi is the best and cheapest option. Remarks: On the first day of school there is an introduction with various activities and the level test. Lessons start on Tuesday (the first week you will have a total of 16 lessons). If the first Monday of your course is a bank holiday, the introduction will take place on Tuesday, and lessons start on Wednesday (the first week you will therefore have a total of 12 lessons). In 2019 the school is closed on 01/01/2019-06/01/2019, 22/04/2019, 01/05/2019, 30/05/2019, 10/06/2019, 15/08/2019, 01/11/2019, 11/11/2019 & 21/12/2019 - 05/01/2020. Missed lessons will not be rescheduled, instead a free excursion is offered on these holidays. The DALF course prepares you for the DALF exam. The course consists of 20 lessons of general French classes and 15 lessons of exam preparation per week. During the 15 individual lessons, a specialised teacher will prepare you for the DALF exam. The DALF course requires an intermediate level of French. To read more about this course please click here. Prices of the DALF-course include the € 100 exam fee (1 exam included). The starting dates for the DALF course 2019 are not fixed yet. Knowledge of French culture and civilisation. Following the DELF course also provides an effective basis for further studies and a competence in French language and knowledge of French life. At the moment, the DELF is the only diploma of French as a foreign language which is officially recognised by the French Ministry of Education. It has been accepted by more than 50 countries and is widely recognised in the professional sector. To read more about the DELF examination course please click here. Prices of the DELF-course includes the € 100 registration fee for one exam fee. The DELF-course prepares you for DELF A1, A2, B1 or B2. If your current level is just under the one of the requested diploma, you will have to do a 4 week Continuous Course before your DELF Preparation Course. Exam dates on request. The Teacher Course is designed for future or current teachers of French as a second language, who are not native French speakers themselves. You must have at least an advanced level of French to take the Teacher Course. The 2-week teacher course includes 26 lessons per week. Language skills and didactic skills, but also French and Provencal culture are on the program. Classes are held from Monday to Friday from 09:00-10:40 and 11:00-12:20 + on three afternoons per week from 13:15-14:45. Group size: max. 10 participants. Advanced knowledge required (C1 / C2). This course can only be booked in combination with the Family Course -parents. It is specially designed for young learners, aged between 9 and 15 years, who would like to learn French together with their parents. The children are teached in a mini group of 4 students with overlapping language levels. To make learning more fun, the programme includes a lot of games, little excursions and visits. The lessons of the parents and the children take place at the same time, the course includes 20 lessons of French. Minimum age is 9 years . This course is suitable for children from 9 to 15 years old. This course can only be booked in combination with the Family Course -juniors and is an ideal option for an educational holiday. The lessons of the parents and the children take place at the same time, the course includes 20 lessons of French. It is specially designed for parents who would like to learn French together with their children (age 9 - 15). The Golden Age course is designed for senior students and combines practice of French language and different aspects of French culture. During this 2 week course you will follow 15 lessons per week and also take part in lots of activities. Morning lessons are devoted to topics and cultural activities are offered in the afternoon. Development with the help of plays, debates, documents, and by using different mediums like newspapers, video, etc. Highly practical approach to the language while developing communication and comprehension. This course leads every participant to a highest possible independence when using and understanding French language. All activities are guided in French. An activity- and excursion programme is included in the Golden Age course. This programme is not available for beginners. The programme of the Duo course depends on professional, academic or personal requirements. It is a course where the participants define their objectives to create an individual programme adapted to their level and learning pace. It is a class for two students. This course can only be booked by two people who travel together and have the same level of French. The duo course can only be booked by two people who travel together and have the same level of French. With exclusive attention from your teacher, the one-to-one course offers you the opportunity to learn at your own pace according to your own needs. 20 lessons per week. The Intensive 30+ course is a course especially designed for adult students who are looking for an intensive program of French classes, in an environment with people of a similar age. The courses consists of 30 lessons which take place in smaller groups with a maximum of 8 students per group. The minimum level for this course is A2. Minimum age is 30 years . This course requires a minimum level of A2. The best way to get involved in the French life is to stay with a host family. This way you will learn about the French customs and of course you will be able to practice your French all the time. The host family supplies you with bed linen and towels. Half board - Single room or double room. Independent but nevertheless convivial type of accommodation. You share a flat with a French person according to the elementary roles of "savoir-vivre". Self-catering. Shared facilities incl. access to the kitchen. Bed linen is supplied, although you do need to bring towels. The maximum distance from the shared apartment to the school is a 30 minute bus ride. The residence (with 50 studios) is located right next to the beach within a 20 minute walk from the school. In a studio you have your own kitchenette and private WC and bath. Basic but comfortable and independent accommodation type to share with other international students. Bed linen and towels are provided. You have access to WIFI connection and the laundry of the residence. A studio is smaller than a single-use apartment. Minimum age to stay in the residence is 18 years.